Ebola virus can persist for months within survivors’ eyes. Live Ebola virus can persist within the eyes for months after a patient recovers from acute Ebola viral disease (EVD), according to a case report from researchers at Emory University. The data findings showed that despite the presence of Ebola virus within one patient’s eye, samples from his tears and conjunctiva (outer eye membrane) tested negative for virus, indicating that casual contact with Ebola survivors carries no risk. The opensource study is published in the New England Journal of Medicine and presented at the ARVO 2015 Annual Meeting in Denver. The team state that the findings point to a need for infection control precautions when Ebola virus disease survivors undergo invasive procedures involving the eyes. It also highlights the need for follow-up care for patients who have recovered from Ebola virus disease. These findings also verify previous reports from Sierra Leone of Ebola survivors suffering from ‘eye sickness’ and becoming partially blind whilst isolated in the farther regions of the country-side. The current study describes a 43-year-old physician who was working in an Ebola treatment unit in Sierra Leone who became infected with Ebola virus. He was transported to the United States and treated at Emory University Hospital’s Serious Communicable Disease Unit for 40 days, including 12 days of mechanical ventilation and 24 days of renal replacement therapy. Two months after his discharge from the hospital, the patient was evaluated at the Emory Eye Center following the development of acute anterior uveitis and severe hypertension in one eye. The team state that uveitis, an inflammation of the middle layer of the eye, can include redness, blurred vision, spots in the visual field, eye pain, headaches, and/or sensitivity to light. Hypertension in the eye can lead to glaucoma. They go on to add that the current outbreak has resulted in the largest number of EVD survivors in history and that EVD survivors require ongoing medical care to manage complications from the infection that may develop during recovery. The results show that following recovery from Ebola virus disease, patients should be followed for the development of eye symptoms including pain, redness, light sensitivity and blurred vision, which may be signs of uveitis. In the current study the patient was treated with topical corticosteroids and medications to decrease the elevated pressure within the eye. Removal of fluid from the eye in a procedure called an ‘anterior chamber paracentesis’ demonstrated live Ebola virus. The virus was found as a result of this invasive procedure. The team recommend that to safely evaluate and treat EVD survivors who develop complications in the eye and other ‘immune-privileged’ sites of the body, healthcare providers who perform invasive procedures should develop standard operating protocols for; 1. Safely donning and doffing PPE; 2. Handling laboratory specimens, and 3. Managing medical waste. The patient has experienced visual recovery following therapy for the uveitis and has ongoing ophthalmic follow-up, state the researchers. The team conclude that the data findings have implications for the thousands of Ebola virus disease survivors in West Africa and also for health care providers who have been evacuated to their home countries for ongoing care. Surveillance for the development of eye disease in the post Ebola period is needed. 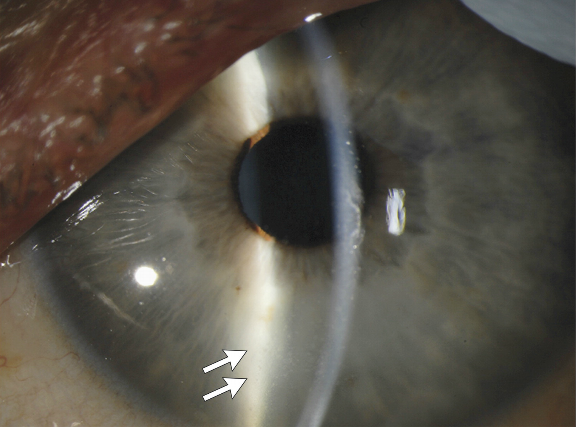 Slit-Lamp Photograph of the Left Eye 14 Weeks after the Onset of Ebola Virus Disease. Mild corneal edema, rare keratic precipitates (arrows), and inflammatory cells and protein in the anterior chamber are consistent with acute anterior uveitis. Persistence of Ebola Virus in Ocular Fluid during Convalescence. Yeh et al 2015.